A warning sign for backyard visitors. Attaches to side of building, fence post, or tree. Patterns drawn FULL SIZE. 13"W. Order hardware parts package separately. Decals also available separately. 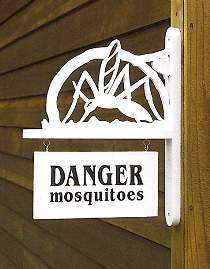 Danger Mosquitoes Hardware includes one piece of 1/2" exterior birch plywood for upper scroll work, two decals and four screw eyes. Remaining project is cut from 3/4" stock. Project plan, 3/4" stock and paint not included.